Today we had our last dives in the 'special diving' helmets. They are super, but they are not light at all. They weigh 27 pounds, which is not an issue in the water, but is when you are getting "hatted" (or, in other words, are having it put on your head). Having the opportunity to work in these helmets has been critical (and fun) as any spacesuit designed for the moon will require a helmet for head protection, visibility, and communication. The helmet provided us all three. 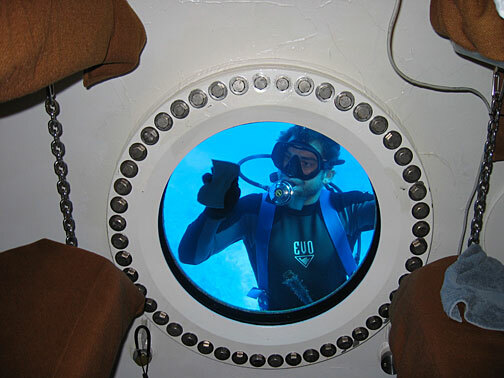 You have probably noticed that we have spent quite a bit of time working outside Aquarius over the past few days. Aquarius is a complicated machine, and the reason we are able to devote so much time to our exploration projects is that our two habitat technicians - Jim Buckley and Dewey Smith - are working very hard to keep her running. They are the first ones out of their bunks each morning, checking the health of Aquarius, and the last ones to turn in at night. In the interim, they spend the better part of the day on the incredible amount of maintenance and upkeep that one would expect when humans put a metal house in this highly corrosive marine environment. Aquarius reminds us a lot of the International Space Station - another complicated machine in another unforgiving environment. Habitat technician Dewey Smith keeping our view of Carpenter Basin crystal clear. Tomorrow is a turn-around day. We'll have a lot of supplies sent down as we prepare for our four days of autonomy. All of our communication with "mission control" will have a built-in time delay of 20 minutes in both directions -- 20 minutes is the average delay in communication we experience between Earth and Mars. Tomorrow also marks the halfway point of our mission. It's hard to believe we'll soon be on the downhill side, especially with the amount of work we have left to do. 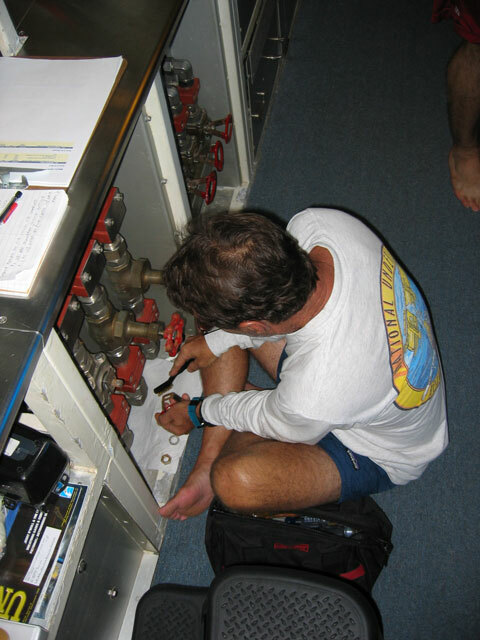 Habitat technician Jim Buckley works on valves of Aquarius' life support system. It is great seeing the crew settle into a rhythm aboard Aquarius. Everyone is happy, healthy....and busy!